Balance or imbalance—Is there a gender disparity in international education in the United States? It is true that more female students come to the US to study than the combined total of US students who study abroad, but a greater proportion of those who study abroad from the US are female. To mark International Women’s Day and this year’s campaign theme of #BalanceforBetter, INTO’s Dana Bukenova and JP Deering examine some of the gender balances and imbalances that define the international education environment in the US. More than half a million female international students are studying in the United States, but women make up a smaller proportion of the total international student population compared to the total number of American students who study overseas. 519,000 female international students enrolled in universities in the United States during the 2017-18 academic year. 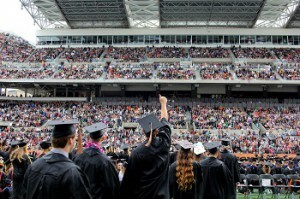 This was significantly more than the total 332,700 men and women who left the US to study abroad the year before. Relatively, however, fewer women are coming to the US to study than are leaving. While women account for roughly 43% of inbound students, they make up 67% of the outbound students. In sending more female than male students to study abroad, the US diverges from the slight majority of countries—about 52% worldwide—whose outbound international student cohorts favor male students. Moreover, when compared to other countries that send greater proportions of female students abroad, such as Japan and Russia, the gender delta in the US is substantially greater. Although both countries received lower Gender Equality Indices than the US from the Organisation for Economic Cooperation and Development (OECD), Japan and Russia send female students to the States in proportions of 54%, and 57%, respectively—far more balanced with the proportions of male students they send. Why, then, do women outpace men when it comes to study abroad in the US? Historical explanations have pointed to the difficulties study abroad poses to timely degree completion in male-dominated fields (i.e. STEM and business) and misconceptions that employability is better served by resume-building at home. But these are just that—misconceptions. In a world where the largest groups of US students studying abroad are pursuing STEM and business degrees, and in a career landscape that places increasing importance on global experience, male students may stand to learn a thing or two from their female counterparts who are more inclined to pursue transformative educational experiences abroad. Although female and male international students in the US have similar motivations to study abroad, women are slightly more motivated to develop themselves and launch good careers. In 2017, INTO partnered with igraduate to conduct a survey of students commencing their studies in our US and UK centers. The women and men who participated in the survey largely shared in their motivations to study abroad—they were equally determined to have a positive impact on the world, and they were equally concerned with career preparedness. There were two prompts, however, in regard to which women demonstrated a slightly stronger motivation than men. When asked to rank their motivation to develop themselves on a scale of 1 to 4 (1 being unmotivated and 4 being highly motivated), the average female INTO student indicated a 3.496-level motivation, as opposed to the males’ average response of 3.457. At the same time, when asked to rank their motivation to study abroad so they could get a good job, women indicated a 3.208-level motivation, compared to men’s average response of 3.164. Women, therefore, share equally strong, if not stronger, drives to study abroad as men. Surely where motivation to improve self and to prepare for good careers is equal between the sexes, so too should be the opportunity to do so. Only one third of female international students in the US choose to pursue STEM. 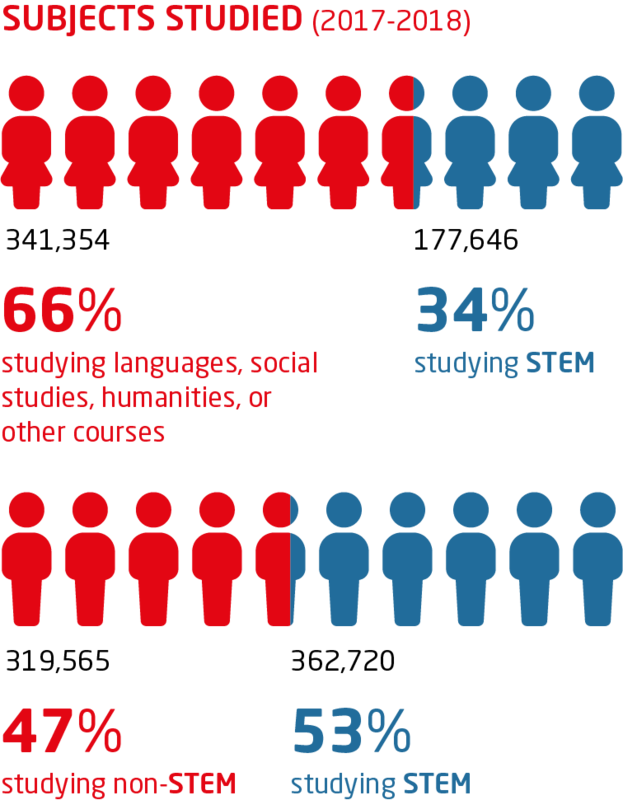 65% of female international students studying in the US choose to study languages, social studies, humanities, or other courses, leaving just 34% who choose STEM subjects. Compare this to the 53% of male international students who study STEM and the 47% who pursue non-STEM subjects. These splits are in line with the OECD’s Program for International Student Assessment (PISA) findings that men tend to outperform women in science and are more likely to graduate with STEM degrees. The OECD attributes this to the fact that women are more likely to excel in other subjects like reading and are therefore more likely to pursue those fields of study. However, the OECD also notes that fewer women around the world pursue careers in STEM fields than are expected to, this based on PISA 2015 data that indicates that more women were high performers in science and indicated great interest in science than graduated with a STEM degree. 41% of high performers surveyed were women, compared to 28% of those who earned a STEM degree between 2012 and 2015. Given what we have learned about female international students thus far—that they are inclined to seek out transformative educational experiences and are motivated by self-development and career preparedness—this underrepresentation suggests a need to change the ways in which teachers ask female students to approach STEM. Two thirds of the 177,646 female international students pursuing STEM degrees in the US hail from two countries: China and India. 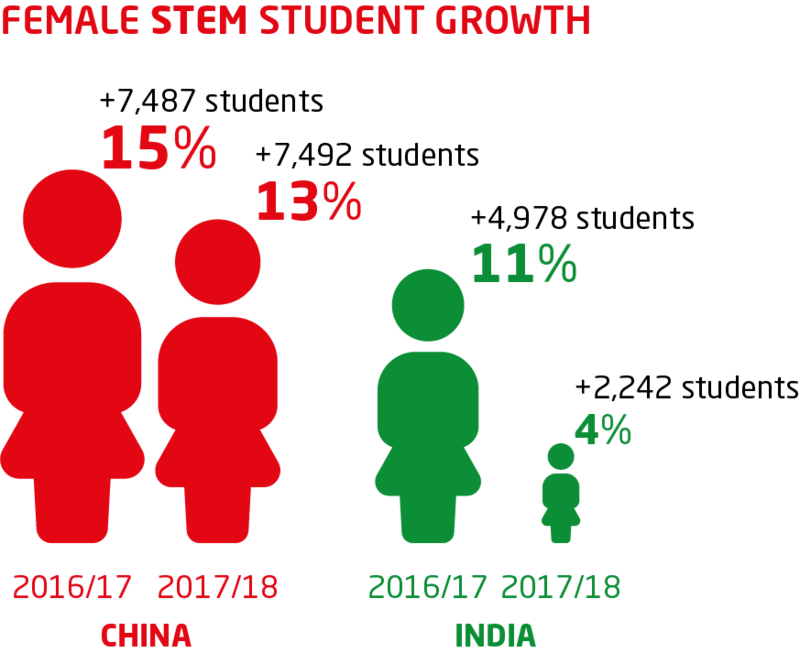 37% of female international STEM students in the US originate from China and 30% hail from India. Certainly, this comes as no surprise given historical enrollment trends and the fact that these two countries are the largest senders of international students to the US. However, growth in the total number of female STEM students enrolling in US institutions from these countries has slowed over the last two years. In China, the slow-down was a less significant drop from 15% growth between 2016 and 2017 to 13% between 2017 and 2018. In India, however, the slow-down was more significant, with a dramatic drop from 11% growth between 2016 and 2017 to 4% between 2017 and 2018. Slowed growth may be attributed to any of several reasons, including increased funding for and prominence of STEM programs in China and India, international perceptions of the US as a welcoming study destination, and, especially where Indian students are concerned, increased visa denial rates. With heightened competition in STEM research from other nations, and with the number of STEM jobs available in the US growing every day, safeguarding the influx of talent into US universities constituted in these two massive cohorts is more important than ever. Iran and India send significantly larger proportions of female STEM international students to the US than any other country. Two of the top five countries for sending STEM students to the US, India and Iran, also send female STEM students to the US in greater proportions than any other country. 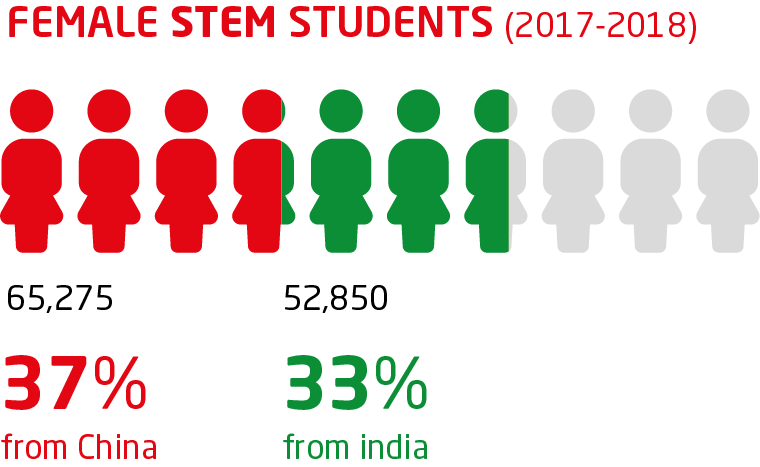 Although growth in female international STEM enrollments from India is slowing, 76% of the 69,105 Indian women studying in the US are pursuing STEM degrees, while 70% of the 4,785 Iranian women studying in the US are doing the same. Relatively, this is twice as many women pursuing STEM in the US as one would expect to find from a given country, a difference that, in the case of Iran, results from the emphasis secondary education places on the applied sciences. Indeed, the proportion of outbound female STEM students in Iran matches the number of female STEM students who pursue their degree in-country—70% in 2015. This same narrative, however, does not define the trend of STEM-pursuing female students in India, a country where women are largely underrepresented in STEM fields. Only 14% of STEM researchers in India are women, compared to the global average of 28.4%. Nevertheless, the relatively large cohort of female STEM students coming to the US from India constitutes a group of women defined by self-efficacy and determination to pursue educational and career opportunities not immediately available in their home country. Is it not, then, must the job of international educators in the US—and, for that matter, around the world—to meet female international students where they are, matching their ambition and fostering their engagement with domestic students so that both cohorts might experience an enriched, global, empowering education? We certainly think so. You think, first, of all the people it’s helped, and how. That £1 million has built new schools and fixed up other schools that were in ruins. It’s opened IT centres and kept them running – IT centres that aren’t only for schoolkids, but their teachers, their families, their communities. You think of individual people helped, like Sonia in Afghanistan. Sonia is 21-years-old, the daughter of a rickshaw puller. Her family arranged her to be married when she was 15-years-old. Her husband was abusive, something that increased when she gave birth to a disabled child, before abandoning her at her parents. It was very difficult for Sonia’s father to maintain the cost of her and her child. Moreover rural Afghanistan society is not friendly for an abandoned woman. But Sonia didn’t give up. She looked for opportunities to earn a living and when the position for a librarian was announced, she applied and was accepted. Sonia is determined to stand on her feet and has the drive to do something with her life, and learned library work and computer use very quickly. That, to me, is what adds weight to the whole thing: it’s philanthropy in its truest, most altruistic sense. In 1998, the United States War College coined an acronym VUCA – volatile, uncertain, complex and ambiguous. It was designed as a conceptual model to help military officers understand the world – and has been popularized by the world’s leading Business Schools. Most of us in international education eagerly anticipate the publication of Open Doors or IPEDS data. For those who can’t wait, dive into our analysis of live international student mobility data from the March 2017 SEVIS data release. We have analyzed differences in volumes of SEVIS registered students all over the United States. This blog and visualization focuses on students from across the Middle East and North Africa. As most international student recruiters already know, diversity is the key to a successful, long-term international recruitment plan. Smart, forward-thinking universities are doing all they can to ensure they are capable of recruiting a diverse international population – but attracting students from across the globe is challenging for a variety of factors and the competition for international students will only intensify in the coming years. Our analysis indicates the decline in enrollments from Saudi Arabia has hit almost every state in the nation – with SEVIS reporting a 33% decline in Saudi students registered in California in March 2017 compared to March 2016. These declines are evenly spread across most states in the United States. Although it is particularly noticeable in the State of Idaho which has seen a 39% drop in Saudi students registered in March 2017 compared to March 2106. The year on year decline in Saudi students is felt across all sectors with a 52% decline in Saudi students enrolled in Language programs compared to March 2016. The drops are more modest, but still evident at Bachelors and Masters Level. At the other end of the spectrum, there has been an increase in the number of Saudi Arabian students registered on Doctoral programs. Iran, the second most populous country, and a major target in President Trump’s Executive orders shows where the US will be vulnerable. With almost 13,000 students registered in March 2017, this showed a healthy increase on the previous year. Iranian students are much less likely to be enrolled in language programs – with the largest cohort registered as doctoral or masters level students. Moreover the recent growth indicates Iranian students evenly distributed across the nation. Whether we will experience a decline in those numbers in the next release of data. Explore the data for yourself – Our interactive graphic allows you to explore these data in more depth by state or by source country in the region. We have also collated these data for every world region and for each university. So please do contact us, if you would like to explore what this means for your school or home state. Our results speak for themselves. We have helped universities grow and then sustain their international student population at levels beyond their peers, often at multiples of national averages. We have comprehensive data for every college and university in the US. Contact Frank Merendino frank.merendino@intoglobal.com to set up a meeting to discuss ways INTO Insights & Analytics can help you meet your campus internationalization goals. New findings from the world’s largest international education agent survey affirm concerns about continued attractiveness of the United States as a study destination. The survey of more than 1300, education counsellors from 85 countries, was conducted by INTO University Partnerships during March and April of 2017. While overall sentiment remains broadly positive, there are significant regional variations in the responses. China, the bedrock of international demand for the United Kingdom and the United States indicates demand will remain buoyant. 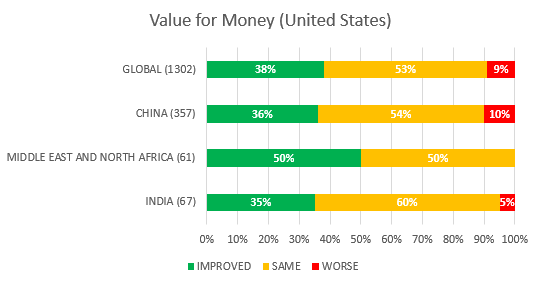 On the other hand, feedback from agents across India and the Middle East indicates that some institutions and countries are going to have to work much harder to overcome some negative perceptions. 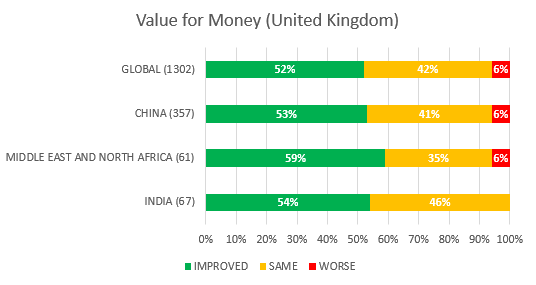 Most agents report improvements in the United Kingdom as a value destination – a by-product of Brexit and the devaluation of UK sterling against most global currencies.Ultimately, demand for an international education remains strong, but this survey provides a powerful reminder that we should not take that demand for granted. Perceptions matter and those institutions and countries who expect to welcome international students need to continue to work hard to develop an offer which remains compelling to them. It is more important than ever that we continue to reinforce the positive messages which have been the recent hallmark of US higher education in the aftermath of the US election and the recent Executive orders. Across the global network of agents, the majority still forecast increases in the number of students coming to the United States and the United Kingdom. (Our more detailed results, available in two weeks will carry details of forecasts for Australia, Canada, Ireland and New Zealand). 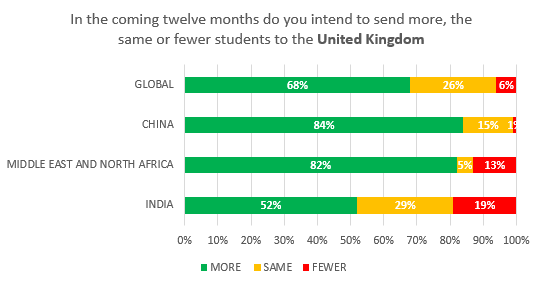 Chinese agents remain most buoyant – all expressing confidence about sending more students in the coming 12 months. What is noticeable however is an increase in the number of agents from India and the Middle East who expect to send fewer students to the United States in the coming twelve months. This appears to be linked to three factors, perceptions of visa processes and welcome and increasing perception of challenges in safety, which we explore in more detail in this post. Agents from the Middle East and India, the United States’ second largest market, report an increase in negative sentiment. More than half the agents in India report the US has become less welcoming over the past 12 months. And almost half of those based in the Middle East and North Africa report a similar shift in perceptions of welcome. This would suggest that the efforts of many college campuses across the United States is more necessary than ever. It is vital to continue to communicate publicly, as in the case at George Mason University, how international students are valuable members of the campus community. But is that enough? It is a more promising picture from the United Kingdom, where Middle Eastern agents remain broadly positive of the United Kingdom as a welcoming destination – less than 15% of agents believe the UK has become a less welcoming destination in the past twelve months. Whether this reflects evidence of a more strident nationalistic rhetoric or the widespread reporting in India of the murder of two Indian workers in Kansas earlier this year, what is very clear is that certain regions are increasingly concerned about the safety of their students in the United States. This is in marked contrast to the United Kingdom, where there is little to no evidence of any rising concern about student safety. (Note, this survey was conducted before the horrific bomb attack in Manchester in late May). For international students, the ability to secure a visa or have confidence that they will be welcomed is a key determinant of where they will end up studying. Through 2016, reports came from India of much higher levels of visa rejection for students intending to study in the United States. This has clearly shaken confidence amongst the agent network in India where more half of all agents confirm they believe the visa situation has gotten worse. This in turn drives almost a quarter of those agents to explore alternative destinations for their students. In terms of countries picking up the slack, Canada, Australia and Ireland all appear on an upwards trajectory. VALUE FOR MONEY – A BREXIT DISCOUNT? Investment in an international education involves life-changing sums of money for students and their families. One very noticeable trend in this year’s survey is agent perception of increased value for study in the United Kingdom. More than half the agents surveyed across all regions report an improvement in the value for money of the United Kingdom. This is hardly surprising, given the devaluation of sterling against most global currencies since the Brexit referendum held on June 23rd 2016. The continued strength of the US dollar does not appear to have had an overly negative impact on the United States per se, except in that in combination with other factors, it may make the US more expensive relative to other major destinations. As the world continues to watch the evolving implications of the Trump administration’s executive orders to restrict certain nationalities from entering the United States, academic institutions have been acting swiftly in response, from university presidents issuing statements against the ban, to widespread student protests. Many campus communities agree international students and scholars not only bring diversity to a university campus, but also contribute to vital research and diverse perspectives to global affairs. “The world is a book, and those who do not travel read only a page,” St Augustine. 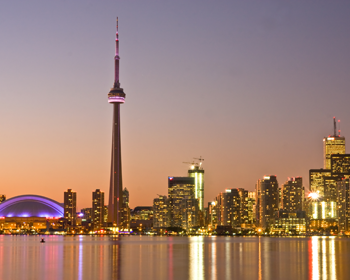 Many young Canadians view studying in the United States as studying abroad. But Raed Ayad says that although both Canada and the US have much to offer prospective students, there is a whole world outside of the two countries which can offer them an even richer experience.